OVERLAND PARK, KANSAS — The Accreditation Council for Business Schools and Programs (ACBSP) www.acbsp.org Baccalaureate/Graduate Degree Board of Commissioners reaffirmed the accreditation of the George Herbert Walker School of Business & Technology business programs at Webster University. Based on the Baldridge Education Criteria for Performance Excellence, ACBSP accreditation evaluates aspects of leadership, strategic planning, relationships with stakeholders, quality of academic programs, faculty credentials, and educational support to determine whether the business programs offers a rigorous educational experience and demonstrate continuous quality improvement. 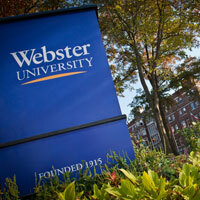 The business programs at Webster University were first accredited by ACBSP in 2008. The University is required to go through the reaffirmation process every 10 years to maintain ACBSP accreditation. The reaccreditation process started last year and included site visits by an ACBSP review team made up of faculty from other business schools in the United States, reviews of curriculum and University policies, and feedback from faculty and students about the business programs offered in the Walker School. Celebrating 30 years of excellence in global business program accreditation, ACBSP is the only organization offering specialized business accreditation for all degree levels, from associate to baccalaureate to doctoral degree programs. “Webster University has shown its commitment to teaching excellence and to the process of quality improvement by participating in the accreditation process,” said ACBSP Chief Accreditation Officer Dr. Steve Parscale, who will present the Certificate of Reaffirmation of Accreditation at ACBSP Conference 2019 in Houston, Texas, on June 23. The Walker School offers 14 undergraduate programs, 20 graduate programs, 14 certificate programs, a doctoral of management degree, dual and combined degree options, and global hybrid courses that allow students to earn one to three credits in a specific subject at an international location. For more information about the Walker School, visit http://www.webster.edu/business-and-technology/. ACBSP, www.acbsp.org, is a leading specialized accreditation body for business education. ACBSP’s mission is to promote continuous improvement and recognize teaching excellence in the accreditation of business education programs throughout the world. Recognized by the Council for Higher Education Accreditation (CHEA) in 2001 and again in 2011, ACBSP was the first to offer specialized business accreditation at all degree levels. ACBSP currently accredits business programs at nearly 1,200 campuses in 60 countries.